E.T.A. Hoffmann, whose stories became the “Tales of Hoffmann” in the Offenbach opera, was a Polish public official until Napoleon’s 1806 invasion. He turned to music and was appointed an orchestra conductor in Bamberg in 1807. In 1811 he fell in love with his 16-year-old music student, who soon married a banker. 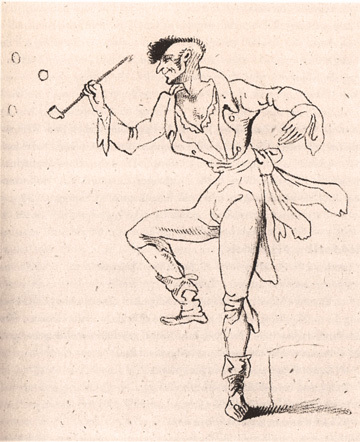 The incident is fictionalized in Hoffmann’s story “The Golden Flower Pot,” published in 1814. The story opens on Ascension Day (Easter) when the student Anselmus crashes into an old woman’s apple cart, scattering her apples and costing him his purse. The hag calls after him (in translation) “You’ll end up in crystal!” or “Into glass you shall pass.” Thus rather than enjoying a beer at the bar as he’d planned, Anselmus sits under an elder tree and “filled a pipe with the health-tobacco which his friend Sub-Rector [assistant headmaster] Paulmann had given him.” The word used in the original is Sanitatsknaster, meaning health-tobacco box. Anselmus’s friend and “health-tobacco” supplier Paulmann appears, and with the help of his 16-year-old daughter Veronica, re-grounds the young student. Paulmann soon sets him up with a job as a copyist to the mysterious archivist Lindhorst, who is said to study all kinds of occult sciences and to be something of an experimental chemist. Lindhorst takes him into a room “where the masters of the Bhagavadita are awaiting us.” In the room, “he could now perceive” sights, sounds and smells he’d formerly been unaware of. “In the early 1800s a pipe filled with hemp and tobacco was known as a Sonntagspfeife (Sunday pipe),” writes Christian Ratsch in Marijuana Medicine.